Shipping is R50 within Durban and surrounds and R80 anywhere else in SA. Processing takes 1-2 business days and delivery takes 1-2 business days within Durban & surrounds and 2-4 business days anywhere else in SA. You should receive an SMS from Dawnwing Couriers once your package is on it’s way but if you don’t, please email casey@hellodarlingpackages.co.za for your tracking number and you can use it to track your parcel on their website. Yes! Just tell us the date you’d like the parcel to be delivered on in the ‘notes’ section at the checkout. Unfortunately, we don’t do exchanges and personalised items cannot be returned. I don’t see what I’m looking for. Can I customise a package? Absolutely! Please send an email with your ideas and we will get in touch with you. Each gift is carefully packaged by us in a custom box, tied with a ribbon and finished off with a handwritten card before being placed in additional packages for shipping. Yes, of course! Just write what you’d like to say in the ‘message’ section at the checkout and we will make sure a handwritten card with your message is included. Can I add personalised engraving, printing, embossing or laser cutting to a product? Yes! 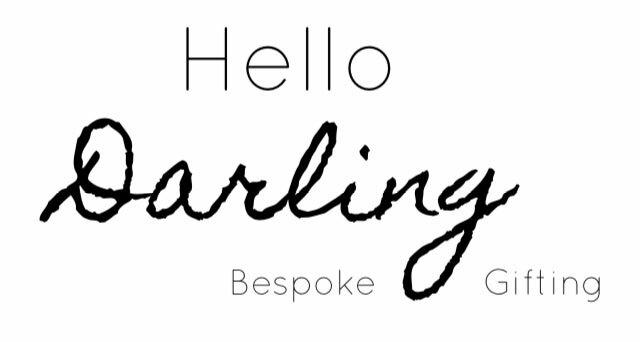 Email us at casey@hellodarlingpackages.co.za for a custom quote. Can I order multiply gift packages for my bridal party or corporate event? We would love that! Please email us if you have personal specifications and we will create the perfect packages for you. Yes! Please chat to us about your quantity and dream box needs. On each gift box detail page we include a complete list of what is included in each box. We never include pricing and purchase information. Every curated gift is packaged in a gift box with tissue paper and a note card with your personal message and then wrapped with a black ribbon and gift tag.